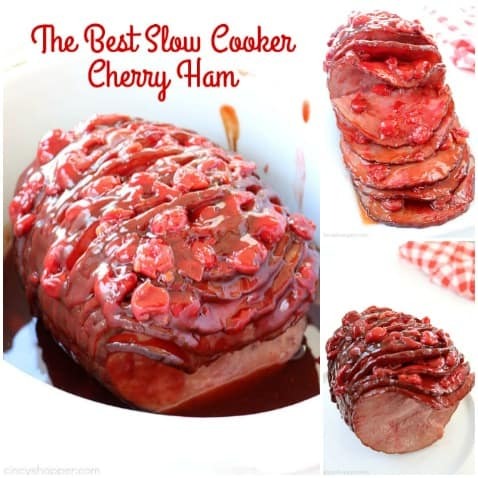 This right here is The Best Slow Cooker Cherry Ham! 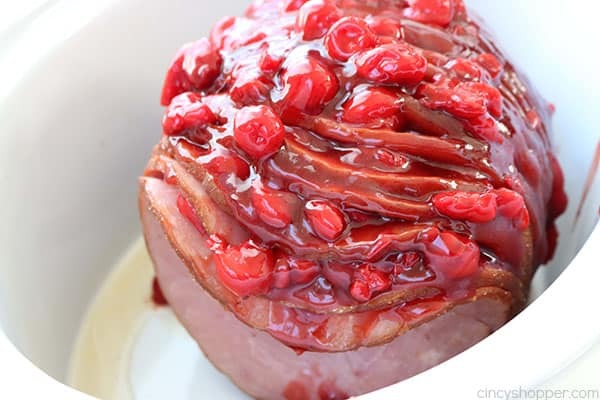 Not your traditional ham recipe but your family will LOVE it! Great for holidays like Christmas and Easter. Over the Christmas holiday season, I made this ham a few times. Each and every time it was a hit. Since I had not shared it with you, I figured I would snap some pics and share it with you to consider for your Easter ham. 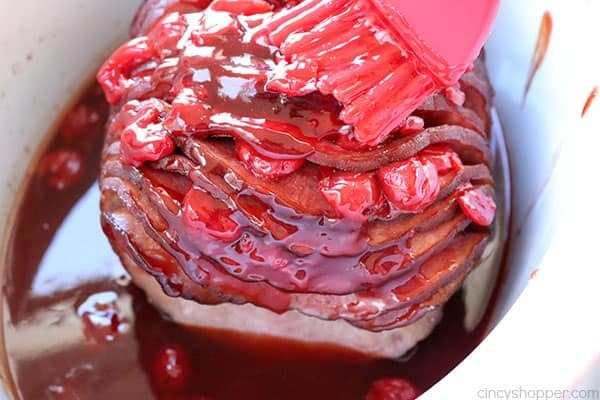 The cherry and brown sugar glaze comes together so quickly. You can have your ham cooking in your Crock-Pot in just a few minutes time. 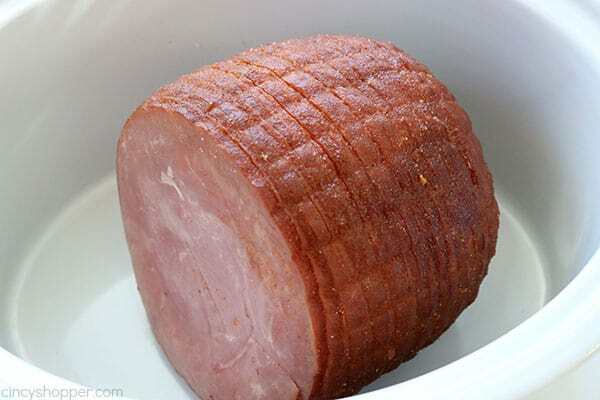 My boys love ham and have requested this recipe quite a few times. I find it shocking because they usually just like traditional flavors. 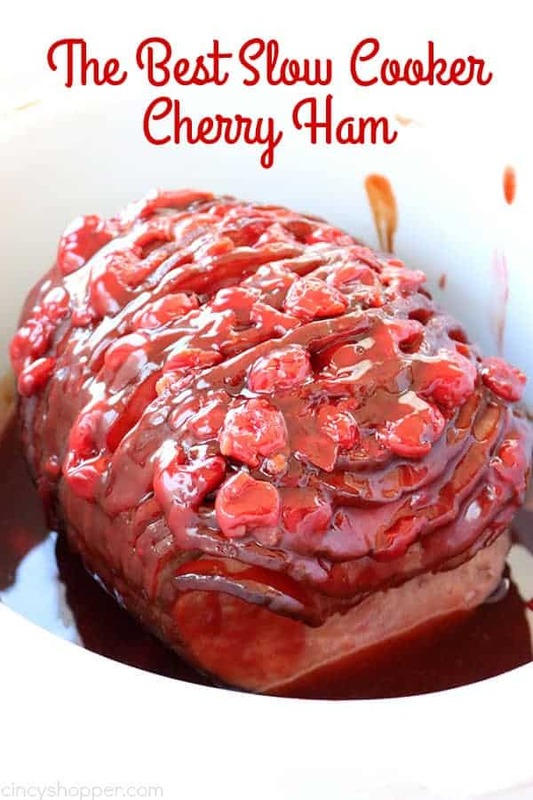 This Cherry Ham is everything but traditional. 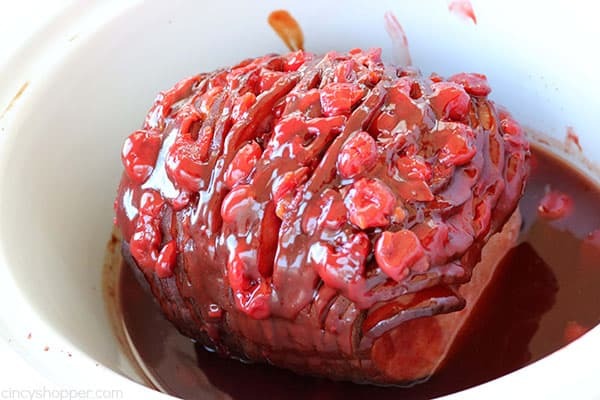 The glaze has amazing flavors that go so well with a ham. Taking pictures of a ham for the blog is always difficult. Let’s face it hams do not always look appealing. It is so difficult to capture in a picture how nice this ham really looks and tastes. 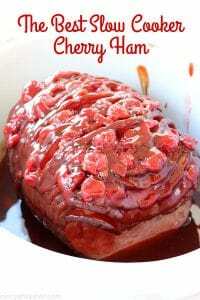 This recipe works great with a boneless spiral sliced ham. You could use this glaze on any type of ham. 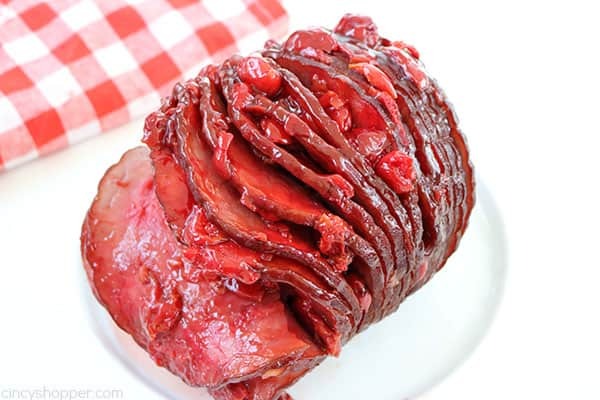 When using a spiral sliced, you can really get the cherry glaze down into each slice of ham so the flavors are in each slice. I like to make an extra batch of the glaze to use for pouring on top after plated. 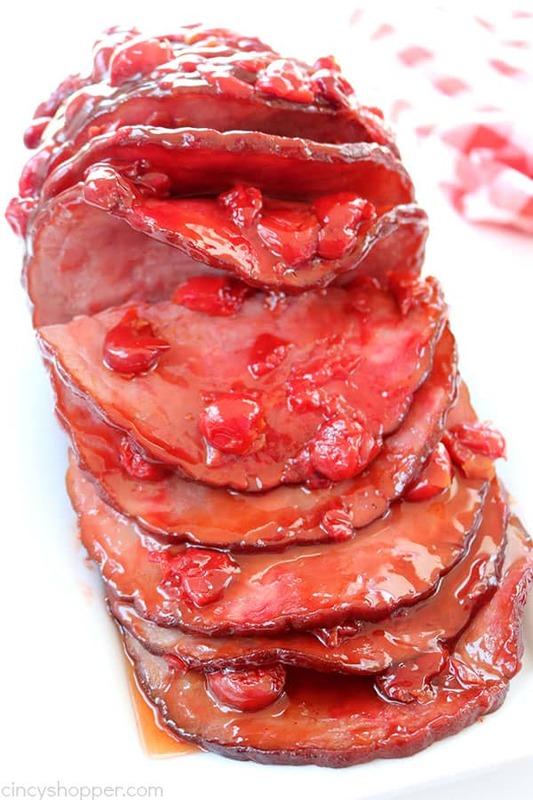 The extra glaze really is not necessary but my boys LOVE this glaze so much that they request more sauce:) If you are making a larger ham, just double up the glaze recipe. When using a large ham, you will want to be sure to have enough glaze for the whole ham. In a medium pan, combine all ingredients except ham. 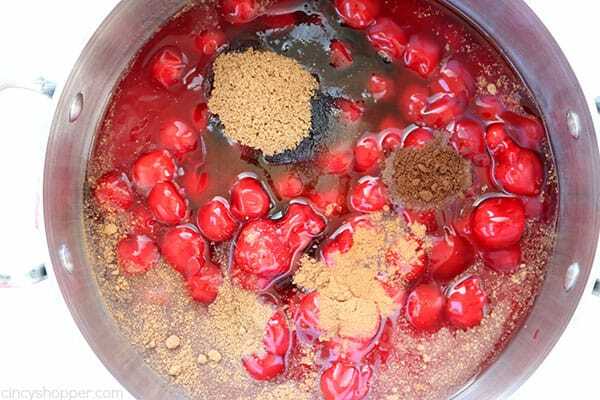 Cook over low for 5-7 minutes, until warmed and blended. 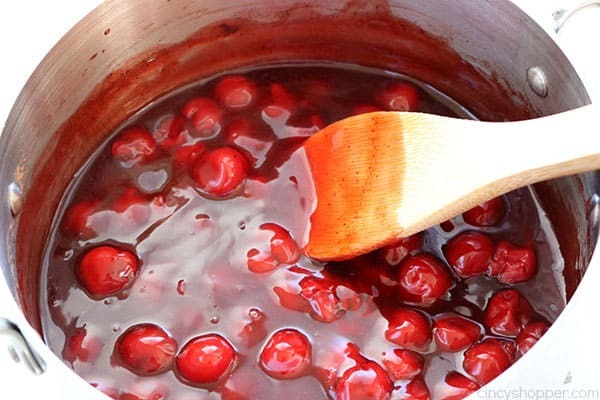 Slightly separate each slice and glaze with mixture, placing 3-4 cherries between each. Cook on high for 2 1/2 hours of low for 4 1/2 hours. Baste with remaining glaze and cook on high for 20 minutes. 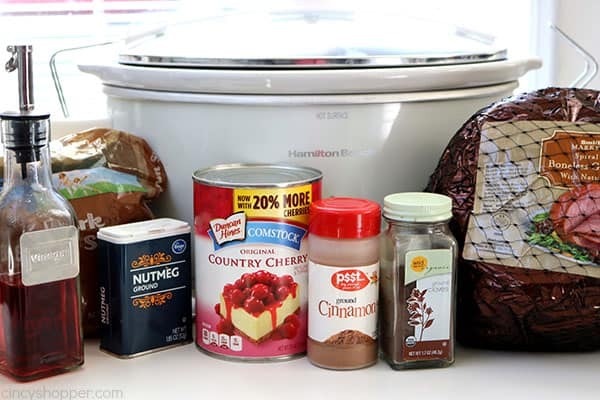 Do you have a favorite Slow Cooker Ham recipe that you make for the holidays? I am in love! It looks so delicious! Amazing idea!